NEWS - What was your greatest learning? 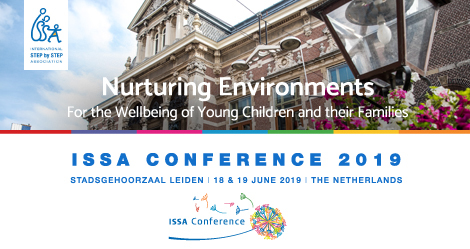 Share it at the ISSA Conference 2019! Nurturing Environments: this year’s conference theme draws attention to the systemic nature of and the shared responsibility we all hold for the environments in which young children live, learn, play and develop. Starting from the home environment - moving through the early childhood services and other spaces in neighborhoods, communities and cities - each experience along the way has the potential to shape the life of a young child. As always, we’re keen to give center-stage to shared learning! Do you have inspiring approaches, experiences, evidences, and ideas about how home-based environments, early childhood services environments and community environments can enhance the well-being of young children and their families? If you are interested in sharing, send your application in English before (extended deadline) 10 February 2019.